This stretch contains 3 sets of significant rapids and swift water channels. Pay attention! The first rapid is Greers’ Rapid. It is located on river left about 1 km down from the Blue Train Bridge. It has some medium size waves and ledges that can hold a canoe if not hit straight with speed. They are easily skirted by staying river right. A few kilometers downstream is Lower Fisher's Rapid, also known as Trash Can. The river turns to the right, creating a set of waves on river left. These rapids often swamp canoes and it is recommended to skirt them on river right. Be aware of the 2 recirculating/boiling eddies on river left if running the rapids! ​The final and biggest set of white water is the Brierley’s Rapids. There is a boat launch on river left just before the rapids. From here the river splits into 2 channels with river left completely missing the rapids. If you choose river right, the rapids are located on the outside bend. To skirt them you need to stay on river left of this channel. There is usually an angled ledge at the beginning of the rapids, which must be hit straight on with speed. It is followed by a long set of standing waves and then a ledge at the bottom. Watch out for the shallow gravel bar at the bottom if you are swimming at this point. Most loaded canoes that run these rapids end up tipping! Skirting is strongly suggested. 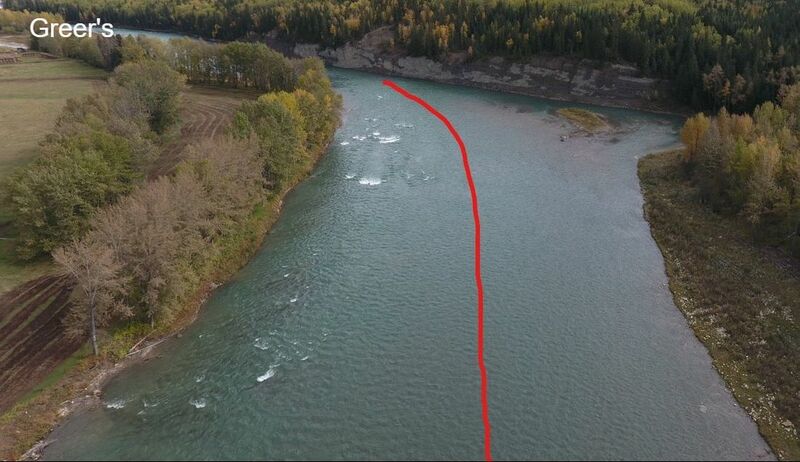 From Brierley's it is a 20 minute paddle to the highway 11A Bridge.